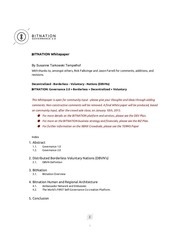 This PDF 1.4 document has been generated by / Skia/PDF, and has been sent on pdf-archive.com on 26/02/2016 at 19:46, from IP address 85.224.x.x. The current document download page has been viewed 400 times. File size: 1 MB (21 pages). on community input, after the crowd sale close, on January 10th, 2015. ● For more details on the BITNATION platform and services, please see the DEV Plan. 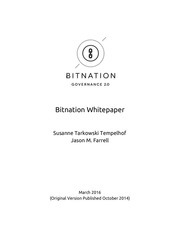 ● For more on the BITNATION business strategy and financials, please see the BIZ Plan. The World's FIRST Self-Governance Co-creation Platform. Geographic Governance Monopolies Throughout History. values, with little means of communication outside their own communities, cohesion was relatively easy. stability, the borders themselves became a source of conflict and resulted in fueling instability. when they do, they often find little changes from one government to the next. otherwise may have little reason for animosity. Decentralized Borderless Voluntary Nations (DBVNs). notary or other trusted third party verifier, the consensus of the blockchain now takes on that role. possibilities with DBVNs are both encouraging and virtually limitless. of legal systems to compete on a free market offering more fair services to its member­citizens. solution instead of having to chose between every single service provider themselves. Aggregation of services is a key part of the solution. and service providers currently available, and then deliver it to the end user in a comprehensive package. Decentralization also benefits from not having any single point of failure in the event of an attack. various clusters, regional or otherwise, are entirely autonomous. coastlines, or seaports. DBVN’s provide services to all areas, regardless of where it is located. assumption, it does not have to be based entirely in the virtual world, nor its services. are inherently free of persecution, intimidation, reprisals, and other forms of systematic violence. so choose to create their own DBVN. people would be primarily connected through a mutual culture and lifestyle expectation. any specific code of law or regulations. DAPPS downloads and Smart Contracts. or poor maintenance of a single blockchain. As far as we are aware, Bitnation is the first attempt to build a DBVN. non­technical governance applications via diplomacy and security. This file has been shared by a user of PDF Archive. Document ID: 00343633.